Let’s face it, when you own a business there’s a lot on your plate and a lot you don’t have time for. It doesn’t mean you’re not community conscious or want to improve your company’s culture - it just means you might need a tiny bit of help. And guess what? That’s okay! Actually, it’s great! This is exactly what the Waxahachie Chamber of Commerce is made for! Don’t believe us? Well, give us a chance to change your mind. 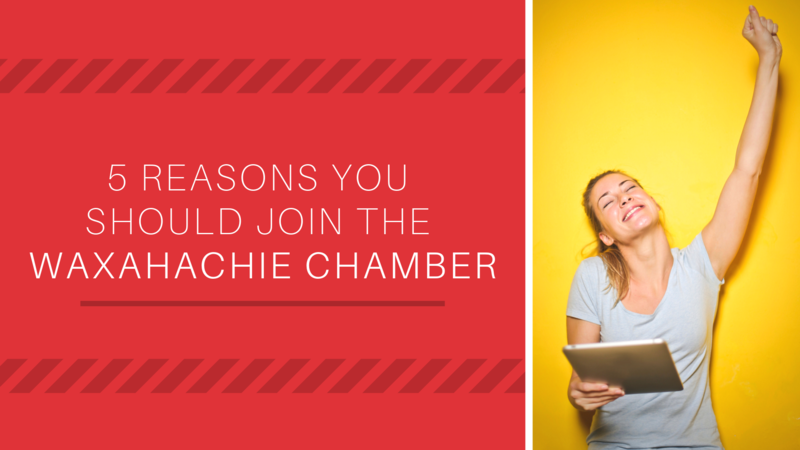 We’ve got 5 reasons why your business should join the Waxahachie Chamber. The Waxahachie Chamber is 90 years old. Do you know what that means? We have credibility. Yup, we have a longstanding reputation with numerous organizations, the City, and the community combined. So if your business is new and wants to establish credibility in the community - then being on our team is something you shouldn’t take for granted. Your membership improves your customer’s perception about you. It gives them a sense of trust. A sense of belonging and accountability. And, plus, who doesn’t like bragging rights? Psh! You take your membership and run wild with it! Brag on, my friend! Brag on! But not only are we bringing the environment of networking, we’re also confident you’re building the right connections to succeed in your field. Maybe you’re needing a plumber? Hey, we know a guy! Maybe your needing volunteers? Hey, we know where to get them! All in all, we make your business, our business. So when you need a contact to further your leads or referrals - we know just the right people. And if we don’t? You better believe it when we say we will find it. Mark our words - We. Will. Find. It. We’re basically the FBI, Google maps, and Facebook ads combined. We know what you want before you do. Whether it’s in the city, county, or state level the Waxahachie Chamber is YOUR voice to the government. When a problem arises that affects businesses and organizations alike, guess who goes to bat for them? We do. If you have issues with opposing regulations, taxes, fees, and things that affect your businesses - tell us and we’ll rise to the occasion and take action. On your behalf, we make sure your voice is heard on matters that your business cares about. “Location. Location. Location is the key to marketing.” Well, that may be true for some but since the rise of the digital age, location includes both brick and mortar establishments, as well as, many online platforms. And sometimes, it’s hard to get in front of the right crowd. But not with us. Whether you’re looking to collaborate with others like yourself, or want more foot traffic to walk through the door - we’ve got your back. We have an online reach that far extends to an audience over 12,000 throughout our social media platforms, including hundreds of users visiting our website on a daily basis. Not to mention, our email subscriber list is about 5 miles long and our walk-ins is even longer - so we know how to get the word out about what our members are up to. “ABC - it’s easy as 123!” If education is what’s stopping you; well, not anymore! We’ve made it easy - nay, FUN to receive a quality education from monthly top-notch classes. We also have some pretty cool programs that allow our businesses to get involved in the academic arena within the primary and secondary school systems of Waxahachie. Basically, your knowledge and involvement with us is limitless! When you have questions like, “I’ve got a tight budget, how do I market without money?” Or maybe, “How do I increase my sales… like now. Right now.” Or, “I’d like to make a difference in a child’s life… could I give a teacher a break and be a guest speaker?” Through our education partnerships, we are able to coach you through the ups and downs your business faces, as well as, give you the opportunity to give back. Think of us as the Sparknotes to your college essay. We’ve got the answers you’ve been looking for. All in all, the Waxahachie Chamber is for businesses, by the businesses, and we want the absolute BEST for YOUR business! So if you’d like to give us a chance through membership - we promise you won’t regret it.